Log into Confluent Cloud at https://confluent.cloud. 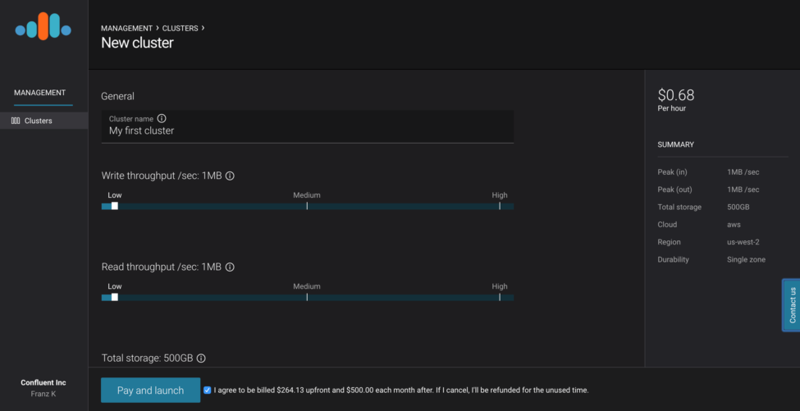 Specify a cluster name, accept the billing terms, and click Pay and launch. Optionally, you can specify read and write throughput, storage, region, and durability. Copy your API key and API secret, accept the acknowledgement, and click Continue. You will use this information to link your Confluent Cloud web interface and Confluent Cloud CLI. The API secret access key may not be retrievable later. 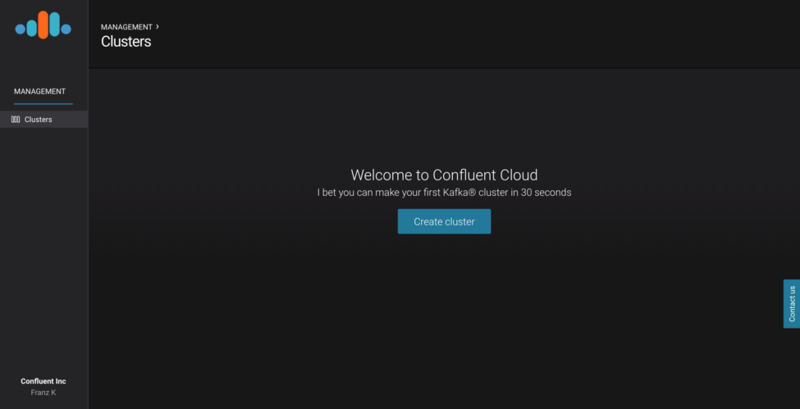 After you have a working Kafka cluster in Confluent Cloud, you can use the Confluent Cloud command line tool to interact with your cluster from your laptop. This quick start describes how to configure Confluent Cloud for Java clients. You can also use Confluent Cloud with librdkafka-based clients. Configure Confluent Cloud CLI by running the init command. This command creates a configuration file located at ~/.ccloud/config. 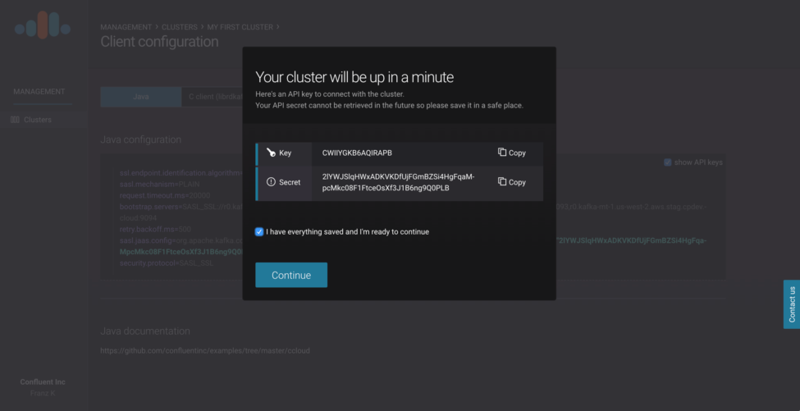 Specify the cluster configuration in the ~/.ccloud/config file based on your client. This cluster information is shown on the Client Configuration tab of Confluent Cloud web interface. Create a topic named test with default options. By default the Confluent Cloud CLI creates topics with a replication factor of 3. Optional: describe the test topic. Modify the test topic to have a retention period of 259200000 milliseconds. $ ccloud topic alter test --config="retention.ms=259200000"
$ Topic configuration for "test" altered. Produce items into the test topic. Consume items from the test topic. Press Ctrl + C to exit. Processed a total of 3 messages. The order of the consumed messages does not match the order that they were produced. This is because the producer spread them over the 10 partitions in the test topic and the consumer reads from all 10 partitions in parallel. Use this command carefully as data loss can occur. Topic "test" marked for deletion. In this step you clone the Examples repository from GitHub and run Confluent Cloud Java examples. The examples repository contains demo applications and code examples for Confluent Platform and Apache Kafka. Clone the Confluent Cloud examples repository from GitHub. Navigate to the /examples/ccloud/java-clients directory. Run the Kafka consumer application to read the records that were just published to the Kafka cluster, and to display the records in the console. In addition to Java, Confluent Cloud also supports these clients. Confluent’s official Python, Golang, and .NET clients for Apache Kafka are all based on librdkafka, as are other community-supported clients such as node-rdkafka. Configure Confluent Cloud CLI by running the init command. Specify the librdkafka cluster config information in the ~/.ccloud/config file. 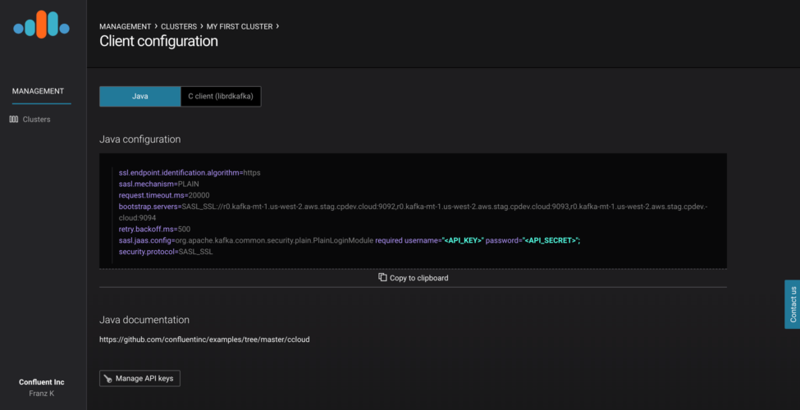 The bootstrap.servers, sasl.username, and sasl.password information is shown on the Client Configuration tab of Confluent Cloud web interface. The api.version.request, broker.version.fallback, and api.version.fallback.ms options specify that librdkafka should use the latest protocol version that it can and not fallback to an older version. For more information about librdkafka and Apache Kafka version compatibility, see the documentation. For a complete list of the librdkafka configuration options, see the documentation. For more information about Confluent Cloud, see the Confluent Cloud documentation.